"Sairat (सैराट)" is an upcoming romantic movie set in a rural backdrop. Written and directed by 61st National award winner "Nagraj Popatrao Manjule" and produced by Nittin Keni, Nikhil Sane and Nagraj Manjule under banner of 'Zee Studios' and 'Aatpat Production'. From this movie "film industry" will be getting two new faces "Akash Thosar" and "Rinku Rajguru" who are playing lead role in film as Parsha and Archi. 'Rinku Rajguru' is already in news for Special Jury Award and special mention for her acting debut in the film at the "63rd National Award 2016". Sairat is not only in news for 'Rinku Rajguru' special mention at the "63rd National Award 2016" for her acting debut in the film. But it was also in news for its official selection for prestigious "66th Berlin International Film Festival (Berlinale)", Its grand scale music recording by composer duo and siblings Ajay-Atul (Gogavale) at 'Sony Scoring Studios' in Hollywood, L.A.. By recording music in Sony Scoring Studios it has became first ever Indian film to record at such a prestigious studio. The film music which is already on all top charts is composed by Ajay-Atul (Gogavale) and it lyrics are written by Ajay-Atul and Nagraj Manjule. In all there are four songs in film three romantic song Sairat Jhala Ji, Aattach Baya Ka Baavarala, Yad Lagla and foot tapping number Jhingat. The song in the movie are sung by Ajay Gogavale, Atul Gogavale, Shreya Ghoshal and Chinmayi Sripada. 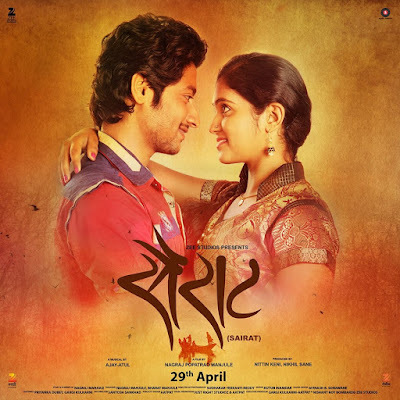 The film is completely shoot in villages near Karmala taluka in Solapur, the scenic in the film is captured by cinematographer Sudhakar Yakkanti Reddy, costumes are handled by Gargi Kulkarni and Priyanaka Dubey, make up is done by Sameer Kadam, Art direction is done by Santosh Sankhad, background score by Ajay-Atul, sound design by Avinash B. Sonawane and film is edited by Kutub Inamdar. Apart from lead actor Akash Thosar and Rinku Rajguru, the actors in film are Tanaji Galgunde, Arbaz Sheikh, Dhananjay Nanaware and Nagraj Manjule. The film is all set to release on 29th April 2016.